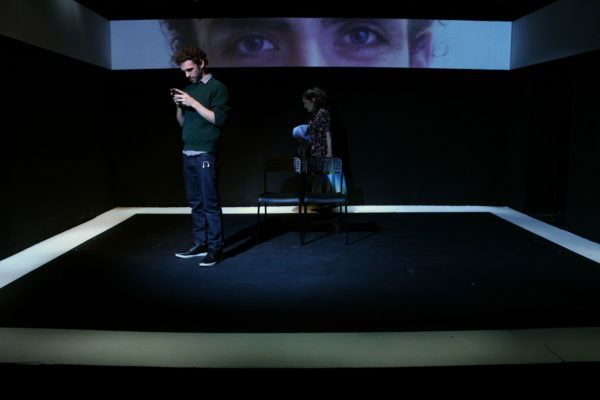 Screens at Theatre503. Photo: Pank Sethi. No longer peripheral objects that simply display content, screens have become integral gateways through which we connect to others and create ourselves. Their role is not simply a mimetic or a visual one; they have become constitutive of our own identity. The overwhelming collage of images, texts, videos, gifs, uploaded by others or by ourselves, end up acting like little pixels building our online presence only to filter through and merge with our daily lives. Stephen Laughton is distinctly aware of this integration and the script reflects the seeming oversaturation of digital information. But it’s also a story about a British family of Turkish-Cypriot heritage with multiple, and perhaps contradictory, identity markers. The result is a nexus of politics and identity that for some is nothing more than the quotidian experience. Although fueled by rich content, strong intellect, and good characterisation, Screens is almost distracted by its own reflection and is slightly stunted by its vast scope. Emine (Fisun Burgess), mother of Al (Declan Perring ) and Ayşe (Nadia Hynes), is confronted by her traumatic and questionable past when she finds a decapitated cat outside her shop. Her children, members of the ‘generation that counts’, are more worried about the present — trending potential and social media presence– and their future– coming out and moving out. But their mother’s past threatens to undermine their understanding of themselves and to dismantle their futures. Director Cressida Brown highlights the offstage presence of the characters by delineating a white perimeter around the stage as offstage space. If it’s a choice to explore the slippage between presence and absence, particularly when thinking about screens and our instantaneous access to external communication, then it only works to an extent. It often becomes distracting in an otherwise very naturalistic piece. And the sparsity of the set, with often great spaces between actors, means that they have to work overtime to bring any connection between characters. Luckily they still do, and Hynes is a standout for her brash, brilliant, and deeply troubled Ayşe. Perring’s Al is honest and sincere, and their relationship as siblings (while being ideological counterpoints) feels genuine. It’s only in the few scenes where the script becomes didactic that the performances suffer, more mouthpieces than fully realised characters. Screens is about the pursuit of our own self-identity. More specifically, of how we measure ourselves: are we defined by who we are or by what we do? The question is of course relevant in an age of constant self-fashioning and branding, but it’s also pressing when national identity is being used as a tool to unite some to the exclusion of others. While Screens sometimes gets lost in the chaos, perhaps that’s part of what the play is about: when navigating through a constant barrage of media, swiping right, scrolling down, image after image, meaning after meaning, it can become overwhelmingly challenging to realise one’s own image. Screens is on until 3rd September 2016. Click here for more information.